My name is Alison Zimmer and I am a RYT 500 hour certified yoga instructor in Huntington Beach, CA. The classes I teach specialize in using yoga as a way to prevent injuries, improve flexibility, and quiet the mind. I took my first yoga class in 2008 at California State University Long Beach and found it to be very hard and uncomfortable. After a couple months I fell in love with the calmness, balance, and flexibility it brought to my life. 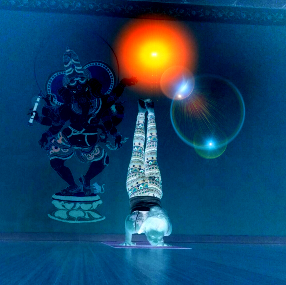 Yoga did something to my life that no sport, no teacher, no friend had ever done. I completed Yoga Shakti's 200-hour teacher training program in 2011 and completed their 300-hour training in 2014. Teaching yoga connects me with people on a whole different level.The love and compassion shared has no words. Seeing my students show up day after day inspires me to be creative and authentic with my teaching! About Alison Zimmer from Love Life Yogi on Vimeo. What do you love about teaching yoga? Everything! I seriously loveeeeee teaching yoga. I am so grateful for the people who come to my classes and enjoy witnessing their healthy transformations. It's so special to be part of something that makes people feel happier and healthier in their lives. I always leave my classes feeling appreciated and filled with gratitude. Who introduced you to yoga? My Dad was the first person to suggest I try yoga. He had started taking classes and knew it would be good for me. It just took me a long time to take his advice. Before I became a yoga teacher, he and I would go to class together once a week at Murdy Park. Now he comes and takes my classes. He was also the person who introduced me to Yoga Shakti (where I did my trainings and currently teach). Inspirational teachers? Diana Pipaloff has taught me everything I know. She is the director at Yoga Shakti and my main teacher. Every time I am around her I learn something new and grow as a teacher. She has taught me so much about yoga. Susan Holden was my teacher at Murdy Park (where my dad and I would take classes together). She was the first person to suggest I consider becoming a yoga teacher. She encouraged me and supported me in so many ways. Favorite pose? Crow Pose. It was the first time I felt strong and connected to my body during yoga. It first appeared to be a pose that I would 'never' be able to do. Once I realized I was able to balance on my hands, my practice changed completely. I trusted myself more and felt more confident about my body. Favorite yoga moment? I love when I have couples in my classes and I see them holding hands while in easy spinal twist. It just melts my heart every time!